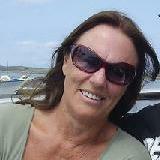 My name is Vigdis and I have been living on ANTIPAROS for 23 years. I speak English, Greek and Norwegian. 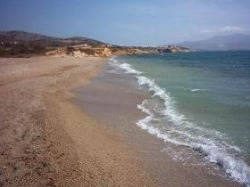 I am here to help you find the perfect accommodation for YOUR holiday on Antiparos. Anything from a simple room to a luxury, staffed villa. If you visit Antiparos out of season, ie April, May, June, September and October, you will have a unique holiday experience. I will prepare a special package of accommodation and activities to suit you and your needs and wishes. • Walk the Byzantine walk in Paros, starting at Lefkes village, with a picknic, and followed by a visit to the Moraitis Winery, where you can buy Paros wine to take home. • When do you wish to come and for how many days do you want to stay. • How many people? Ages of children. • Where would you like to stay, in Antiparos Town, in Soros or St Georgio? • What kind of accommodation would you prefer? • Do you have any special requirements? With the above information I will be able to research and find the perfect place for you. I recommend only places inspected and known by me personally and send you my own photos.I charge 10% for my work. 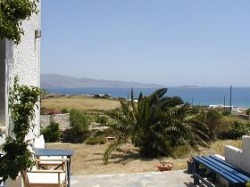 This holiday house is in Soros, about 400m from the beach, with wonderful views towards Paros, Naxos and Ios. It is 100m2 with a garden of 2300 m2. 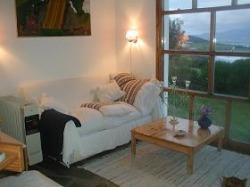 The house is suitable for a family or for a group of friends. There are 3 bedrooms for 5 people and the price is absolutely reasonable compared to some of the outrageous prices you will find if you want to rent a house in the Cyclades (100 euro a day in June and Juli and 150 euro a day in August). The house is fully furnished, with a well equipped kitchen, art and photographs on the walls, and thousands of books in many languages. There is also a washing machine, TV and video. • terrace with pergola for eating outside The house is fully furnished, with a well equipped kitchen, art and photographs on the walls, and thousands of books in many languages. There is also a washing machine, TV and video. Price for June/July 100 euro per day.